So let’s give you a whistle stop guide to the Spring/Summer 2018 trends, inspired by Vogue’s round up so you can find the hidden bag gems that are in the sale. Snap up these and you will rock your heaps of looks over the next six months – now that’s what I call value for money! Dark indigo denim – bright colour handbag – don’t be shy! Ice-cream pastels – match the pastel or go neutral – taste the tranquility! Slip dresses – accent with a colour already in the outfit to float on by! Pencil skirts – opt for a top handle bag – go on, be top of the class! Embellishments – fringes or plastic – carry it on through to the bag. Be consistent! This is the Michael Kors Sylvie Leather Medium Messenger Bag in bright red. Was £240 and is now £150 at John Lewis. Love your Ice Cream Coloured Pastels. Avoid looking like the neapolitan flavour; one pastel at a time. This is the Marc Jacobs Recruit leather crossbody bag in lilac found in Harvey Nichols. Was £275 and is now £165. Going bold? Put up to 3 Primary Colours in one outfit. Use your bag to help! 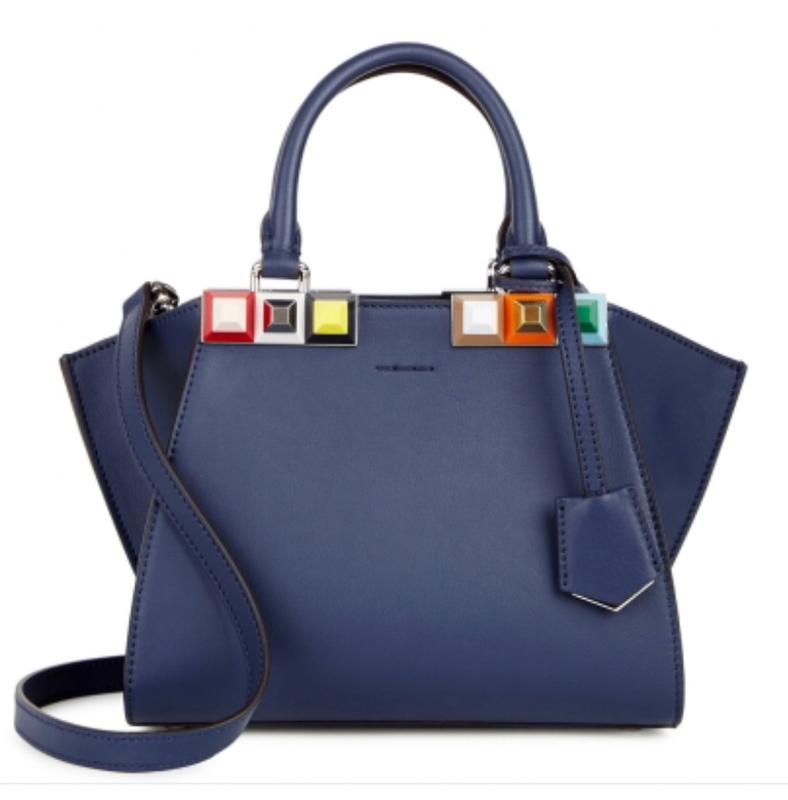 This bright beauty is from Sophie Hulme, the Albion box in colbat blue at Harvey Nichols. Was £450 and is now £225 (50% off). Spring time and showers means Trench Coats. Reach for the natural tan bag to hit the right tones. The leather Saddle Bag is from Aspinal of London is a classic and is ideal as a top handle as well as a shoulder bag. Was £450 is now £315. Showing some leg in your Shorts? Style the look with a structured shoulder bag for the girl about town look not the girl from Ipanema! This brilliant white bag is from Mark Cross, the Benchley box bag in leather. At Harvey Nichols. Was £1840 and is now £1104. This bag will offer you 9 months of wear at least! A high waisted Pencil Skirt means keep your bag low. A top handle is the ideal pairing. You can always rely on Fendi for a top handle bag and this is the mini 3Jours navy leather tote with a few brightly coloured stud embellishments – covering off another spring/summer trend. Was £1870 and is now £1122. Fringing is the popular embellishment and follow through your detail on to your bag! From Reiss, the Jinx Tassel bag in classic black at John Lewis is ideal. Was £125 and is now £95.00. So there you have it – the guide to getting the most out of the Christmas and New Year handbag sales. Channel (not Chanel) the spring/summer 2018 fashion trends and seek a bag that will seek more dates than the Bumble app! With a clear idea of the bag you need, you will be in and out of the sales quicker than the hokey-cokey dance.